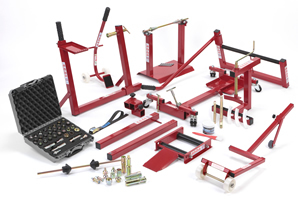 abba Motorcycle equipment have been designing and manufacturing motorcycle stands, lifts and workshop equipment for almost 25 years. We are a family run business that was founded in 1992 by Mr Alan Burdett. After extensive testing of new ideas of various ways of lifting a motorcycle, and many prototypes later, the abba superbike stand was born. Lifting a motorcycle from the centre of the bike was a huge advantage as it was much more secure and enables the bike to be pivoted back to raise the front wheel. This, combined with the unique design of the new stand, made it a very SAFE one person operation! A patent was filed for the abba superbike stand which was duly granted. This gave the abba superbike stand a great advantage in the market as it was and still is the only stand available that would enable you to perform certain types of tasks on a motorcycle, tasks that were much more difficult with conventional stands that were previously available. The superbike stand proved to be very successful in the UK and now worldwide with 10,000's of superbike stands now sold in more than 25 countries worldwide! Following on from the success of the superbike stand, we moved on to designing and manufacturing more unique products based on the same concept of being practical, versatile, easy and safer to use than anything else on the market. After almost 20 years of manufacturing out of our industrial unit in Maldon in Essex, which we had massively outgrown, we decided it was time to move to larger premises. 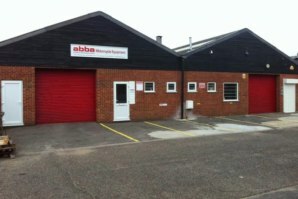 In late 2011 we moved into our current premises (shown in picture) in South Woodham Ferrers in Essex. This allowed us more space to invest in new machinery to keep virtually all processes of our manufacturing "in house" which gives us full control of our products, so we know every product that leaves our door is top quality and ready for use. The extra free space also allowed our design team to flourish and since moving to our new premises the abba Front Lift arm, abba Sky Lift and other smaller products have been designed and are now selling worldwide. Our products are now used by many motorcycle manufactures, dealers, MOT stations, Race teams, UK police forces, the British Superbike Championship and thousands of customers worldwide! Thanks for taking the time to find out more about us.